Maire Loughran, CPA, is a member of the American Institute of Certified Public Accountants. 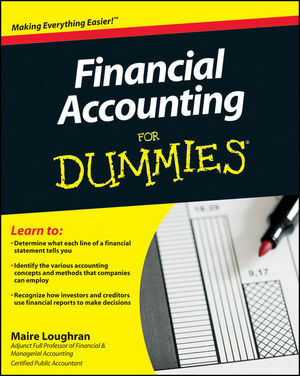 An adjunct professor of auditing, accounting, and taxation courses, she is also the author of Auditing For Dummies. Part I: Getting a Financial Accounting Initiation. Chapter 1: Seeing the Big Picture of Financial Accounting. Chapter 2: Making Mom Proud: Financial Accounting Career Options. Chapter 3: Introducing the Big Three Financial Statements. Chapter 4: Acronym Alert! Setting the Standards for Financial Accounting. Part II: Reviewing Some Accounting Basics. Chapter 5: Booking It: The Process behind Financial Accounting. Chapter 6: Focusing on Accounting Methods and Concepts. Part III: Spending Quality Time with the Balance Sheet. Chapter 7: Assessing the Balance Sheet’s Asset Section. Chapter 8: Digging for Debt in the Liabilities Section. Chapter 9: Letting Owners Know Where They Stand: The Equity Section. Part IV: Investigating Income and Cash Flow. Chapter 10: Searching for Profi t or Loss on the Income Statement. Chapter 11: Following the Money by Studying Cash Flow. Chapter 12: Examining Depreciation Cost Flow Assumptions. Chapter 13: Learning about Inventory Cost Flow Assumptions. Part V: Analyzing the Financial Statements. Chapter 14: Using Ratios and Other Tools. Chapter 15: Got Your Dictionary Ready? Reading Explanatory Notes and Disclosures. Chapter 16: Studying the Report to the Shareholders. Part VI: Feeling Brave? Tackling More Advanced Financial Accounting Topics. Chapter 17: Accounting for Business Combinations. Chapter 18: Accounting for Income Taxes. Chapter 19: Accounting for Leases. Chapter 20: Reporting Changes in Methods and the Correction of Errors. Chapter 21: Ten Financial Accounting Shenanigans. Chapter 22: Ten Industries with Special Accounting Standards.